Rally, demonstration or riot: the phenomenon of mob mentality may be the trigger that transforms a peaceful crowd into a violent one. As the community of Ferguson struggles to maintain peace in its streets they have instituted a mandatory curfew and police are patrolling the streets in armored vehicles, using smoke and tear gas on people who refuse to disperse. 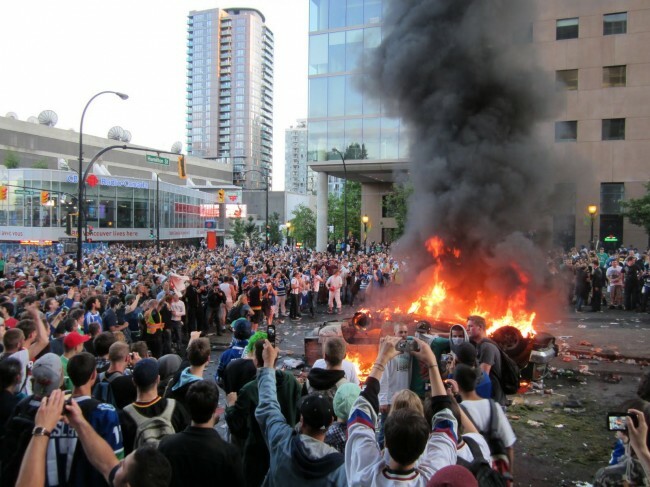 The town is attempting to avoid the kind of violence and mayhem that has previously occurred following the acquittal of the four police officers involved in the Rodney King beating in Los Angeles in 1992, in Vancouver after the 2011 Stanley Cup finals game or in Detroit after the 1984 World Series. Poverty is not the cause of rioting and looting. Neither is social unrest or hopelessness, and experts say justifying such behavior with these theories only leads to more of the same behavior. A study from the University of Leeds found that it takes only about 5 percent of a crowd to influence the group’s direction, with the other 95 percent following without even realizing what they are doing. There are situations when mob mentality can be a good thing, such as in disasters or other emergencies when large groups of people need to be moved but communication is difficult. However, by the same mechanism, rioting, looting and violence can be triggered by only a small number of people. There is typically little planning when mob violence and looting erupt. Forensic psychiatrist Dr. Michael Welner says that there are typically a small number of hardened criminals found in mobs who play an important role in establishing the vicious tone of the chaos. He says that explaining away behavior as anger, disenchantment or a quest for social change tends to legitimize the lawlessness caused by mob mentality, and even cause it to be imitated elsewhere. Former New York Mayor David Dinkins responded to the 1991 Crown Heights riots in Brooklyn by saying that the rioters “needed to vent,” even while restraining police. The 2005 riots in France brought explanations of poor opportunities for unintegrated youth. Welner says these types of sympathetic reactions justify violent free-for-alls and a general disregard of the law. Violence does not occur everywhere, even when mass assemblies are present. Todd Fuist, Western sociology professor, says that new social norms can develop in certain settings. The phenomenon is known as the Emergent Norm Theory, and it happens when people behave outside of normal behavior, such as breaking windows, throwing beer bottles and looting. Emergent Norm Theory is related to how many people are involved. Fuist says it is much more unlikely that someone will get caught if they are doing something in a crowd of 500 than if there are only two people doing it. Western Washington University psychology professor Dr. David Sattler says reinforcement is an important part of setting off an incident of mob mentality and spectators can add to that encouragement, even by simply standing around and staring open-mouthed. Often the observers are taking videos and photographs, but Sattler says just their very presence can be all the encouragement needed. Fuist says if there is no crowd there is no riot. He also says that the reaction of authorities has an effect on the brutality of the crowd’s actions. Resistance from authorities causes resistance in return. Welner agrees that the solution is not a brutal police force, nor is arrest. Perpetrators know that there is very little chance of legal consequences for looting and destroying property when in the midst of chaos. He says that rather than making excuses for violent behavior, the media should emphasize the problems created for those victimized by the random violence. Massing empathy and mobilizing public outrage against the perpetrators can be particularly effective. Rioters have no respect for society or their victims, but, according to Welner, they are selfish enough to be sensitive to shaming themselves or their loved ones. He cites the elimination of racist speech through public shaming, and advises learning from this example to contain the violence and riots caused by mob mentality, before it is perpetuated through emulation elsewhere. 2 Responses to "Mob Mentality: Why They Riot"
This is an absolutely brilliant and fascinating read. Thank you, Beth!